WASHINGTON – The U.S. Department of Transportation’s Federal Highway Administration (FHWA) today (3-26-15) kicked off National Work Zone Awareness Week as construction season in most northern states approaches. Deputy Federal Highway Administrator Gregory Nadeau joined state and federal officials at the Washington Boulevard Bridge over Columbia Pike in Arlington, Va., to urge drivers to stay alert when driving near highway workers. They were joined by workers and families affected by work zone crashes. This year’s theme, “Expect the Unexpected,” emphasizes the need for drivers to constantly be prepared for changes such as reduced speed limits; narrowed, shifted or closed lanes; and people who may be working on or near the road. In 2013, the most recent year for which data are available, there were 579 fatalities in work zones, a small decrease from 617 fatalities the previous year. National Work Zone Awareness Week, sponsored by federal, state and local transportation officials at the beginning of construction season each spring, raises awareness of safety measures taken on roads all over the country. Typically, work zone crashes occur when drivers fail to obey posted speed limits, fail to adapt to changing road conditions, or use cellphones while driving. FHWA works with state and local transportation officials to promote improvements in work zone planning and design, increased law enforcement near work zones, enhanced worker training and heightened awareness among drivers. Since 2005, FHWA has awarded nearly $33 million in grants to promote work zone safety training and the National Work Zone Safety Information Clearinghouse. In 2013, speed was a factor in 23 percent of fatal work zone crashes. Two out of three victims in work zone crashes in 2013 were drivers and passengers of vehicles. During the ceremony, Nadeau paid tribute to the 132 Virginia Department of Transportation employees who died in highway work zones since 1928. Like the FHWA, the Federal Motor Carrier Safety Administration (FMCSA) works with other USDOT agencies to reduce work zone crashes through grants to states and research on driver behavior. FMCSA has made work zone safety a national priority in its commercial vehicle safety plans, and partners with the International Association of Chiefs of Police in its “Drive to Save Lives” campaign to encourage all law enforcement to stop trucks and buses when they are seen operating unsafely. For more information on this year’s National Work Zone Awareness Week, visithttp://www.ops.fhwa.dot.gov/wz/outreach/wz_awareness.htm, follow @USDOTFHWA on Twitter, or search trending topics #NWZAW and #safeworkzones. Toms River, NJ – March 23, 2015 – Before you hire a mover do some research to avoid problems. All Moving companies are required to be licensed, but regulations vary; for moving within NJ (intrastate), movers must be licensed with the NJ Division of Consumer Affairs. For moving out of NJ, they must have a 'DOT' and ‘MC’ number, issued by the Federal Motor Carrier Safety Administration. Check the 'Consumer Resources/ Links section at www.njmovers.com for the correct government website to verify license information, regulations, and important brochures. Get three estimates: Don't rely on prices quoted on the Internet or phone because they are subject to change on moving day! Check references for movers with family & friends, check the BBB* (www.bbb.org) for the number of complaints (not just the letter grade). If the mover is licensed, then call for an appointment. Don’t accept a mover that doesn’t come to your home; low prices quoted over the phone or on the Internet can be changed on moving day. Have a written list of items to be moved and show each estimator all items to be moved and not to be moved. Show them all items that you expect the mover to pack and what you will pack; request a separate price to pack items that you may be unable to pack like large pictures, mirrors lamps, TV's or electronic items. Remember, if the price sounds too good to be true, it probably is! Be aware of what can change the price on moving day: A mover is allowed to change the price if ANY circumstances change that was not included in the written document, but he must give you the new price BEFORE they start: Realize you may be accepting increased cost when you sign documents. Additional charges can be expected for services such as: (a) You did not request packing of boxes or did not get all your packing completed as shown to the estimator. (b) Your destination has flights of stairs or elevator, and not written on the estimate (c) Access to your new residence is more that 75 feet from the mover's truck to your front door or, if a large truck can’t get within a reasonable distance, a smaller shuttle truck may be required. (d) You have added or changed the items to be moved, changed dates or destination. (e) Delays beyond the mover’s control; such as weather, waiting time, rearranging furniture or restacking in a storage space, basement, attic or garage. (f) Storage, handling and redelivery costs. What coverage is included for damages? Movers are legally responsible for damages up to $.60 per pound per article; for example, if a large screen TV weighs 100 pounds, it is covered for $60.00. You should consider purchasing insurance or increased valuation through the mover or your homeowner’s policy or other insurer before the move begins. Movers do not assume any responsibility for: (a) Money, jewelry or collections. (b) Mechanical or electronic items or loss of data. (c) Items previously broken or repaired. (d) Loss or damage to items packed in cartons by you and loss or damaged items not documented on delivery. Items that are packed and unpacked by the mover are only covered up to $.60 per lb unless you purchase additional coverage. Other important items: Do not pack or move items that may cause damage to your shipment, such as matches, flammables, propane, aerosols or liquids like bleach; this could void all insurance. Don’t sign a blank ‘change order’. Understand how payment is accepted by mover. Be sure to keep a copy of everything you sign until the move is finished. You are about to give everything you own to people that you do not know; its wise to do research first! New Jersey employees of NJMTA members who seek to pursue a college education at an accredited two-year or four-year college or university or at an accredited vocational/technical institution. Scholarships are made on academic potential, financial need and unusual circumstances without reference to race, creed, gender, disability, religion or national origin. New Jersey residents who are *dependent children, age 23 and under, of full-time New Jersey based employees of a NJMTA member, in good standing. The member company must have a minimum of six months membership with NJMTA. *Dependent children are natural and legally adopted children or stepchildren living in the employee’s household or primarily supported by the employee. There will be three (3) $1,000 scholarships awarded. Awards are for undergraduate study only. Interested students must complete the NJMTA Scholarship Fund Application for the next academic year and mail to NJMTA, 160 Tices Lane, East Brunswick, NJ 08816, along with current transcript of grades, post marked no later than May 22, 2015. Recipients will be notified in June. Applicants are responsible for gathering and submitting all necessary information. Applications are evaluated on the information supplied; therefore, it is important to answer all questions as completely, as possible. All information received is considered confidential and is reviewed only by the scholarship committee and NJMTA staff. The final selection of recipients is made by the NJMTA Scholarship Committee. The committee will evaluate all applications on the basis of past educational performance and future potential, work experience, statement of career and educational aspirations and goals, leadership and participation in school and community activities. Unusual circumstances and financial need will be given careful consideration. Anyone who serves on the Scholarship Committee agrees that their family members will not be eligible to participate in the program. The award check will be mailed directly to the school in the student’s name. The Federal Motor Carrier Safety Administration is extending the submission deadline for the 2015 “Be Ready. 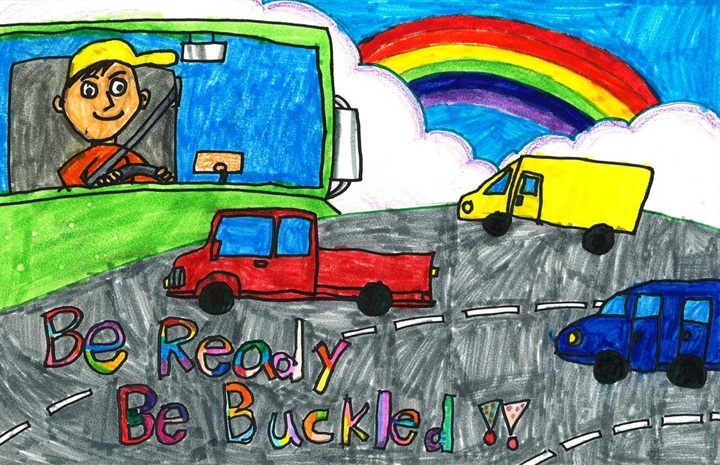 Be Buckled” student art contest until March 16, 2015. The contest is being held to educate kids about highway safety and urges commercial drivers to buckle up on every trip. The contest was organized by the Commercial Motor Vehicle safety Belt Partnership and is open to students in kindergarten through sixth grade with relatives or sponsors in the commercial truck and bus industries. Artwork is evaluated in two categories by age groups: kindergarten through second grade and third through sixth grade. Twelve winners will be selected and their artwork will appear in the 2016 “Be Ready. Be Buckled” contest calendar. In addition to having their artwork included in the calendar, all 12 students will also be honored at a ceremony at U.S. Department of Transportation headquarters in the spring. To find out more about the “Be Ready. Be Buckled” contest, click here. Five Republicans in the U.S. House have introduced a bill that would require shippers, brokers, freight forwarders and others to vet carriers prior to hiring them. The bill also aims to remove the public assumption that carrier rankings in the DOT’s Compliance, Safety, Accountability program should be used as a tool to hire carriers. The bill would require those hiring carriers to: (1) check their registration status with the DOT, (2) ensure they hold the proper amount of liability insurance and (3) ensure they have not been given “unsatisfactory” safety ratings. A similar bill was introduced last year, but did not make it out of committee. Part of the enhancements to safety, the lawmakers say, will be removing the “confusing and conflicting vagaries” of CSA’s BASIC rankings — a move pushed in this bill by the broker trade group Transportation Intermediaries Association. “TIA will continue to advocate that the CSA initiative is a valuable internal tool for the Agency, but until the Safety Fitness Determination rulemaking is complete, the BASIC data should not be used as a tool for carrier selection,” according to the lawmakers’ announcement of the bill. Major trucking groups like the American Trucking Associations and the Owner-Operator Independent Drivers Association have made a call in recent months to take it a step further than TIA’s bill. They have asked FMCSA and lawmakers to remove the CSA rankings from public view so they could not be used as against carriers, either hiring or otherwise. The Commercial Vehicle Safety Alliance — the group representing the enforcement community — has also asked FMCSA to remove the scores from public view until the agency can shore up concerns from industry stakeholders regarding its data quality and its methodology. ARLINGTON, Va., Friday, Feb. 27 – A federally appointed committee tasked with negotiating a future driver-training rule for entry-level truck and bus drivers has wrapped up its first two-day meeting. Land Line Magazine Managing Editor Jami Jones says the committee has its ground rules in place to move forward and has formed subcommittees tasked with finding a consensus on a training curriculum, accreditation and cost-benefit analysis. The Federal Motor Carrier Safety Administration’s 26 member Entry-Level Driver Training Advisory Committee consists of representatives from Owner-Operator Independent Drivers Association, American Trucking Associations, trucking schools, bus and motor coach groups, unions, law enforcement, FMCSA and more. Congress required FMCSA to form the committee to negotiate a rulemaking. “They moved forward in developing committees to address all of those different key items that they identified either as problematic or issues that need to be addressed,” she said. Some of the subcommittees will tackle cost-benefit analysis of a driver-training rule, certification/accreditation for training facilities, and an entry-level driver training curriculum. Jones says it’s interesting that FMCSA is focusing so intently on cost-benefit for a training rule. “The agency seems more bent on justifying this one through a cost-benefit than they have on other rulemakings like insurance minimums where they just grabbed at whatever research was out there and said, yep, we’re good to go,” she said. Data, she said, has never been collected that follows a driver candidate through a training school and tracks the candidate’s performance on the road. Subcommittee work could help determine a way forward on that issue. “They are tasked with coming to a consensus of the framework of what a curriculum should be, how it should be measured, how it should be tracked – all of those things,” Jones said. The committee is scheduled to meet five more times: March 19-20, April 9-10, April 23-24, May 14-15 and May 28-29. Committee members were asked to complete their work by May 29 and have a written statement ready for the agency by mid-June. Arlington, Va. – The American Trucking Associations is asking the estimated 46.3 million motorists that are expected to take to the highways this Thanksgiving to drive safely and follow several simple tips in order to keep this a safe and joyous holiday season. "It seems so simple, but buckling up, planning ahead and leaving yourself a little extra time can make all the difference,” said Share the Road Professional Driver Thomas Miller with Prime Inc. “Winter weather can also make travel treacherous, so if it looks like the roads will get bad, stay home and wait to travel. “This is a season where many professional drivers, including the ones that delivered an estimated 46 million turkeys for Thanksgiving, are away from home, so in addition to sharing the road safely, make sure you give them a little extra thought and thanks as you travel this year,” ATA President and CEO Bill Graves said. Share the Road is a highway safety outreach program of the American Trucking Associations that educates all drivers about sharing the roads safely with large trucks. An elite team of professional truck drivers with millions of accident-free miles deliver life-saving messages to millions of motorists annually. The safety program is sponsored by Mack Trucks Inc. and Michelin North America Inc. www.atastr.org. Follow the Share the Road on Twitter and Facebook. CDL driver's Self-Certification and Medical Certificate due - Jan. 30, 2015 or license will be suspended! · Select a Route allows you to pick up the lane(s) best for your organization. · Donate a Wreath allows you to support the 150th Anniversary of Arlington National Cemetary by placing a wreath at every gravestone. · Sponsor a Load matches your funds to an owner operator needing assistance to haul a load. You determine your level of giving. Trucking plays an essential role in WAA’s annual wreath-laying event. Every year, professional truck drivers donate their time and motor carriers donate their trucks and fuel to deliver the wreaths. In 2013 alone, more than 500,000 wreaths were delivered to almost 900 veterans cemeteries across the United States. Since 2012, TCA has coordinated this nationwide effort, as well as raised money for the placement of wreaths at Arlington National Cemetery. The goal is to place a wreath on every gravestone at Arlington National Cemetary in honor of its 150th Anniversary.